Detroit Lakes, MN. (August 26-27th, 2016) – The 2016 B-Spec National Championship continued with the seventh round at Ojibwe Forests Rally, where Maxxis and Honda Performance Development traveled with their 2015 B-Spec Fit to again contest the B-Spec class. 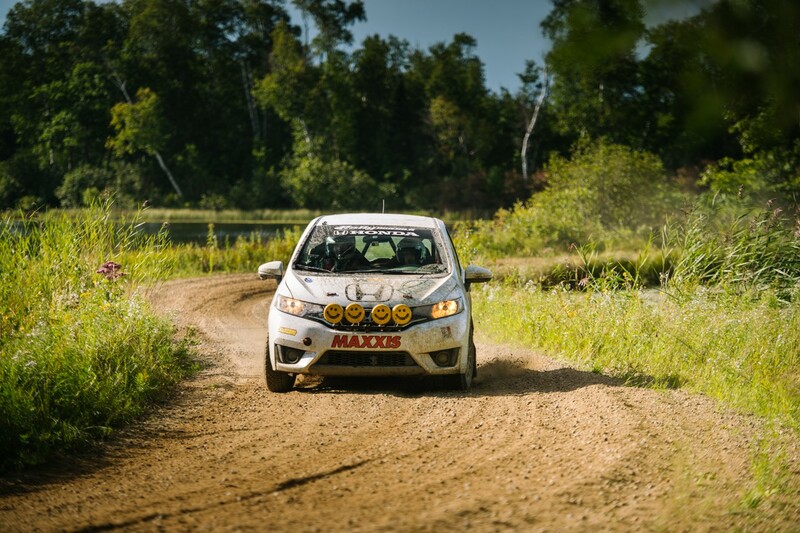 At the conclusion of the New England Forest Rally, the Maxxis/HPD Rally Team was narrowly in second place in the season-long B-Spec championship. 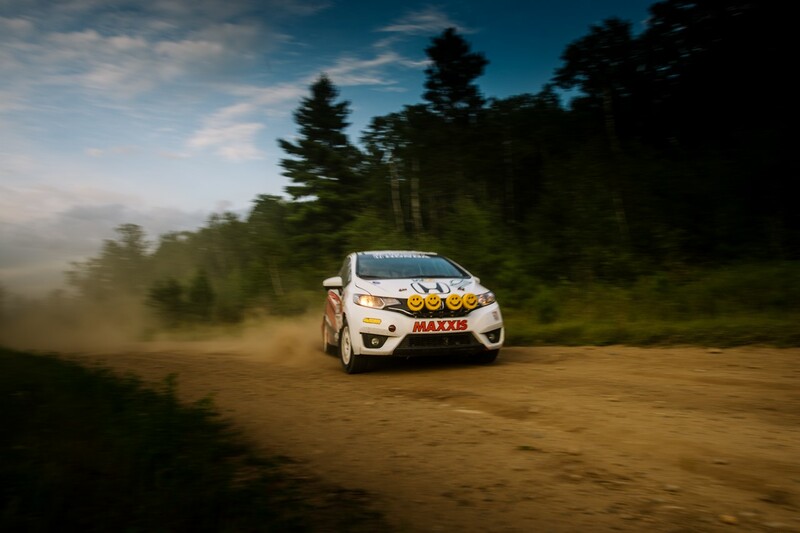 The team of Keanna Erickson-Chang and Ole Holter in their B-spec Ford Fiesta would be sure to keep up their momentum going into Ojibwe Forests Rally, so the Maxxis/HPD team would need to focus on picking up its pace and ensuring the car wouldn’t suffer from any mechanical failures. Ojibwe Forests Rally stages are known to be quite technically challenging. Some areas are fast and flowing, while others are tight and twisty, with varying surfaces from gravel to sand. Day 1 would consist of three stages, run twice each. The Maxxis/HPD team began Stage 1 with a bit of caution, trying to feel how the repairs to the Fit would hold up over some of the rougher sections in the stage. The sun had set by Stage 3, so the remaining stages would be run at night. After a quick service, the Fit team turned up the pace a bit for the remaining three stages of the day. As the teams came to the finish, the Fit had built up a two minute, 20-second lead in B-Spec, and was narrowly in third place in 2WD. Just after exiting service, en route to the next round of stages, the weather turned to a light rain, then to an intense downpour, combined with heavy hail. While only lasting a few minutes, conditions on the next stage had deteriorated heavily from the first running of the day, featuring a huge amount of standing water, even deeper puddles and very slippery terrain. This caused some difficulty for the team, and all competitors, but the remaining stages weren’t in as rough a shape, so the team was able to keep up the pace and make it to the final two stages, to be held on the streets of Detroit Lakes.